Southee goes outside off-stump and this time the outside edge goes straight to Taylor for a simple catch. Brathwaite brings up his 50 with a nicely played shot off the pads through deep backward square leg. A solid fifty for Brathwaite. 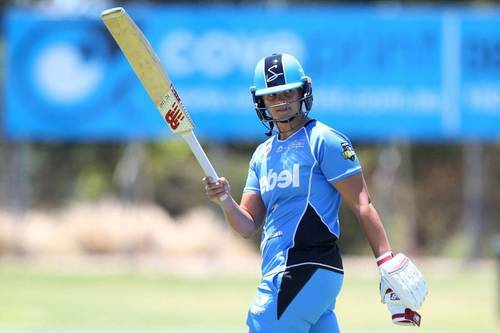 53 off 75 balls. Southee looking good. But coming very close to overstepping almost every ball. Colin de Grandhomme into the attack for NZ. Chase times one beautifully to get off the mark with a boundary. Chase is beaten by a full and wide delivery from de Grandhomme. Chase then gets a four from an outside edge that goes between second slip and gully. Chase tries to repeat a similar off-drive that went for four a couple balls before but this time he plays around a straight one from de Grandhomme. Sunil Ambris is in for Windies. Stokes isn't having a good time with Canterbury. Unbelievable. Ambris hit wicket AGAIN. Second time in three innings. 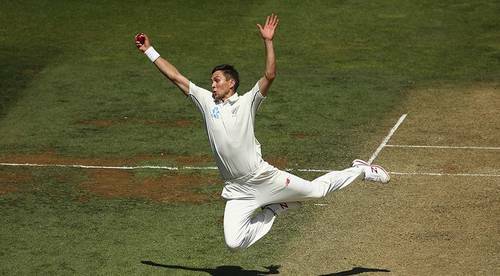 Even Boult who got the wicket felt sorry for Ambris. Dowrich is in for the Windies. They're in a bit of a hole now. FOUR! Brathwaite flicks one through mid wicket off de Grandhomme. Nicely timed again. 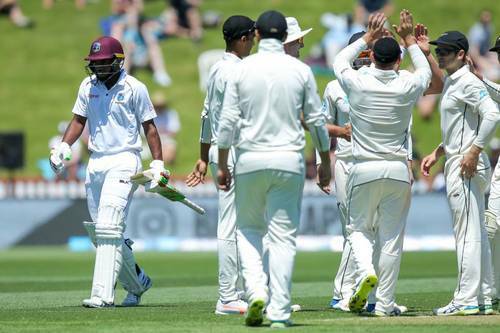 Brathwaite is still battling to keep things alive for the Windies but wickets are falling all around him. Dowrich gets off the mark with a single that goes through between the cover and point gap. Time for drinks. FOUR! Dowrich drives one down the ground from a slightly over-pitched Boult delivery. The big wicket of Brathwaite falls and the West Indies are now in a huge hole. FOUR! Dowrich strikes one nicely into the off-side on the backfoot. FOUR! 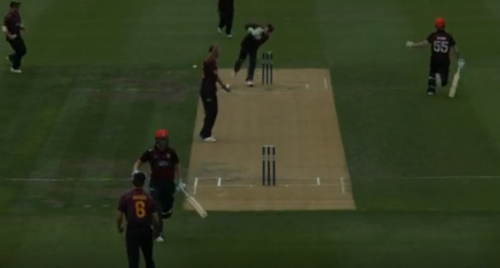 Dowrich follows that with a nicely timed pull shot from a shorter Boult ball. Another four for Dowrich as he times an on-drive perfectly. Dowrich is batting well as he tries to salvage something for the Windies. Southee is back into the attack for NZ. Wagner is back in now. Tidy Southee over. Dowrich is the Windies' main source of runs at the moment. Reifer struggling to deal with Southee. Easy caught and bowled by Wagner. Dowrich can't get over a shorter ball and lobs a top edge high which falls easily for Wagner. Williamson showcases his left arm throw - not bad. Maiden over for Wagner. Runs have really dried up for the Windies. Niall Anderson will be taking over for the last 50 or so minutes. Kioara koutou. As Joel says, we're in for a late one tonight, weather permitting - we could go as late as 7.30 to make up for lost time and lost overs due to the earlier rain. Southee continues.